From adorable dogs to cuddly kittens to friendly fish, young readers are introduced to popular family pets and how to care for them. 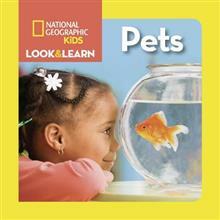 Using simple, age-appropriate text paired with colorful photos, Look & Learn books introduce children to a subject on one spread and then show it i... read full description below. From adorable dogs to cuddly kittens to friendly fish, young readers are introduced to popular family pets and how to care for them. Using simple, age-appropriate text paired with colorful photos, Look & Learn books introduce children to a subject on one spread and then show it in a real-life context on the next.